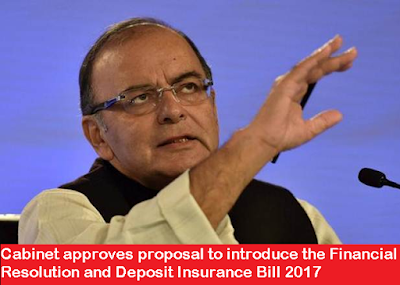 Cabinet approves proposal to introduce the Financial Resolution and Deposit Insurance Bill 2017. The Bill would provide for a comprehensive resolution framework for specified financial sector entities to deal with bankruptcy situation in banks, insurance companies and financial sector entities. New Delhi 14 May 2017: The Union Cabinet chaired by the Prime Minister Shri Narendra Modi has approved the proposal to introduce a Financial Resolution and Deposit Insurance Bill, 2017. The Bill would provide for a comprehensive resolution framework for specified financial sector entities to deal with bankruptcy situation in banks, insurance companies and financial sector entities. The Government has recently enacted the Insolvency and Bankruptcy Code, 2016 ("Code") for the insolvency resolution of non- financial entities. The proposed Bill complements the Code by providing a resolution framework for the financial sector. Once implemented, this Bill together with the Code will provide a comprehensive resolution framework for the economy.